Layout-101 is a first layout with click to action buttons. WhatsApp number must be in international format without “+” sign. Don’t use any zeros, brackets or dashes in WhatsApp number. There are two web links option in layout options. You can use it for website link, social media link, play store link etc. These links will be opened in external/system browser. Functions like Click to Call will not work in desktop, but all action buttons works fine in mobile. 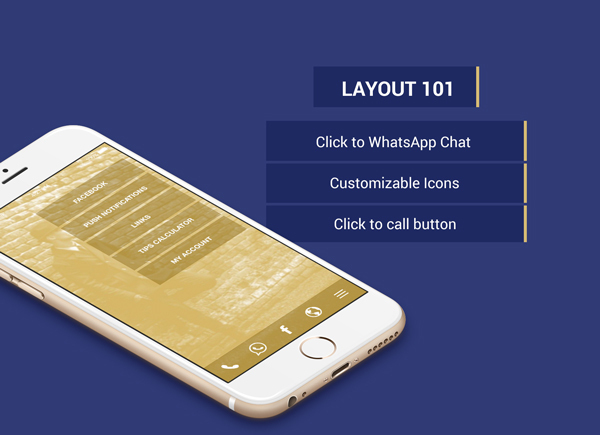 What is WhatsApp Click to Chat? WhatsApp’s Click to Chat feature allows you to begin a chat with someone without having their phone number saved in your phone’s address book.